This salad is a recent invention of mine that combines ingredients of several other salads that I like. It draws its main inspiration from the famous Waldrof Salad. I use three different lettuces to give it variety of color and texture. 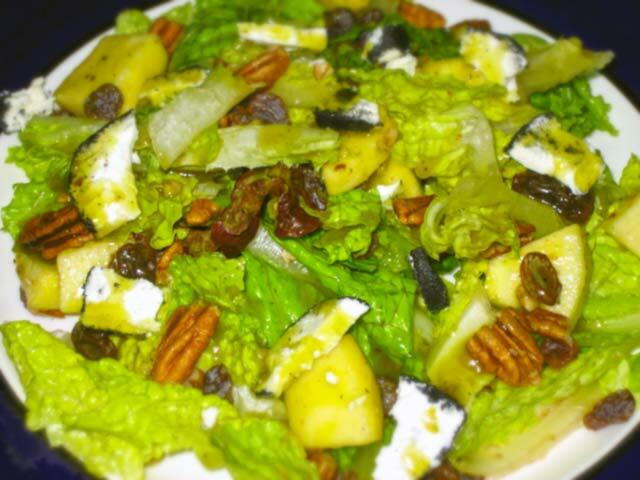 The romaine lettuce to add to the salad’s crispiness which is further magnified by the apples and the walnuts. Red and green loose-leaf lettuce give the salad some contrast in color, and make it a sweeter, softer flavor that blends perfectly with the honey and the ash covered goat cheese. Instead of using grapes, like in the traditional Waldrof salad , I preffer raisins. I also omit the mayonnaise dressing in favor of a Honey Mustard Vinaigrette. To top it all up I sprinkle some chopped walnuts, and ash covered goat cheese to give it some tang. Overall I could say that this salad is a very fresh take on contrasting flavors and textures. It is crisp,soft, tangy and sweet all at once. If there is an ingredient that brings the whole salad together it is the pecans. The pecans server as an earthly flavoring that stands in middle ground to balance the crisp from the soft, and the tangy from the sweet. It is crisp,soft, tangy and sweet all at once. Per request of my readers, I will post the recipe. If you enjoy it please leave me a comment in the bottom of this post. Wash and disinfect the three types of lettuce. A good tip is to wash the lettuce in ice cold water to give the salad more crispiness. Rinse off the water. Hand shred the lettuce to bite size pieces and add to a big bowl. Peel and core the apples, and cut them up into 3/4 of an inch pieces. Add the apples to the bowl. Chop the pecans in half or into quarters depending on your preference and add to the bowl. Finally add the raisins to the bowl and toss the salad to mix all the ingredients. Serve into plates. Make sure to have good portions of all the ingredients. Add the goat cheese in small slices to the served plates and drizzle with the honey mustard vinaigrette according to your own taste. Add the honey to a medium size mixing bowl. Add the vinegar and the mustard and whisk until fully integrated. Finely mince the clove of garlic. I would say that the garlic is optional because some people do not enjoy it. Add the kosher salt and grind some black pepper to the mixture. Whisk it once more. Continue whisking and slowly add the olive oil. You can vary the amount according to the thickness you want for the salad dressing. If you add more oil it will become thinner. If you prefer a thick dressing add less. Same goes for the honey. If you prefer it sweeter add more honey. The final result should be an emulsion that does not separate.